Yesterday, we published a post with updated results regarding Betting Against the Public in MLB. As of Wednesday, MLB underdogs that closed with less than 30% of spread bets were +9.99 units on the season. Contrarian betting is a key component considered in selecting our MLB Best Bets, which are +60.36 units since the start of the 2012 season and a red-hot +14.57 units since May 1. Interesting in trying our MLB Best Bets? Get four days of MLB picks now with a $49 trial of our Pro membership. – Game 1 of the NBA Finals tips off tonight with the Spurs currently listed as 4.5-point favorites across the sports betting marketplace. On May 21st, Andrew Wiggins was a -150 favorite to be the 1st overall pick in the NBA Draft. Joel Embiid is now the front runner at -300. 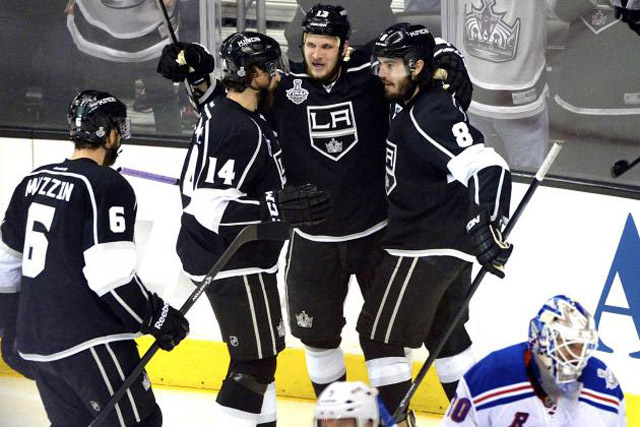 The Kings grabbed a 1-0 series lead in the Stanley Cup Final with a 3-2 overtime win last night against the Rangers. At the time of publication, Game 2 lines are not yet available, but visit our Free NHL Betting Trends page for updated lines and public betting percentages. The Daily Sweat: You Get an Article, You Get an Article, Everyone Gets an Article!! !